How Can A Pillow Change Snoring? Snoring, one of the things that kills sleeping together with others in the same bed or the same room as you. Many of us who snore, find it to be completely embarrassing and a nuisance, and some even cannot sleep through the night due to snoring. But what is even the cause of snoring anyway? Snoring is the noisy result we hear whenever our airways, especially through the nasal passageway are obstructed while we are breathing. There are many ways that the world has tries to combat snoring from nasal drops and sprays to patches to be worn on the nose. One thing that is not considered enough is how your pillow and mattress can and does affect your health, your sleep and your snoring as well. The position in which you sleep dramatically impacts the way that you breathe, which is why when you have a cough it is suggested to you that you should sleep upright. Snoring is not different and requires that you will sleep in a position more conducive to normal and natural breathing. A pillow that is shaped in a way especially like a wedge will keep you sleeping laying down but slightly elevated. With your head elevated your nasal and respiratory pathways will be more freely open. Durable: These pillows have to be durable and long lasting to get through the nights sleep and also be lasting you for months on end. While some pillows need to be replaced often, these are more expensive and need to be an investment once. Size: The size of the pillow is important because you need a pillow that allows you to move around and sleep comfortably. You should also have options for the size of the pillow as not everyone sleeps on a standard bed. 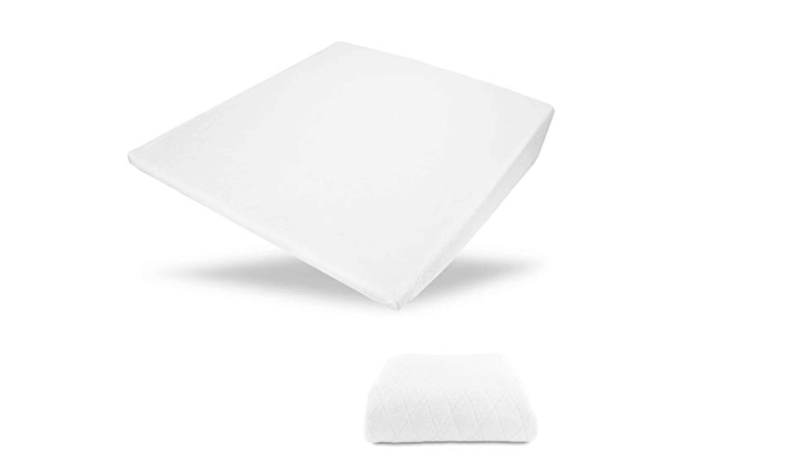 Promotes better breathing: Whether the pillow is made with built-in air ventilation or channels or is made with breathable material, the airflow in your pillow should be good quality to keep you dry, and cool throughout the evening. If you are not overheated you breathe better and that coupled with the pillow shape and being hypoallergenic and dust mite resistant in order to keep your breathing easy and calm. Free of harsh chemicals and heavy metals: You are going to want a pillow that is not manufactured with mercury or other metals. Chemicals should also not be used in the cleaning, processing, stuffing or sending of your pillow as you and your loved ones will be laying their face flat against it each evening. As far as wedge pillows go, MedSlant has created an extremely comfortable pillow that you can lean up against or sleep throughout the night on. This pillow is great for those who suffer from acid reflux and/or nightly snoring that interrupt your sleep and those around you as well. The way this pillow is shaped will elevate your head in a way that uses gravity in your favor to keep your airways open, and your breathing even. In addition to the shape of the pillow assisting your airways, the fact that the pillow is hypoallergenic keeping unwanted irritants from entering into your respiratory system. This pillow is made in America so you know where it was created and that it is made without ozone depleters and harsh chemicals. There are no heavy metals in the making of this pillow as well, which means when you lay down each night you can fully trust the pillow you are sleeping on. This is an extra wide pillow measuring twenty-eight inches across, so you can move around on the pillow throughout the evening. 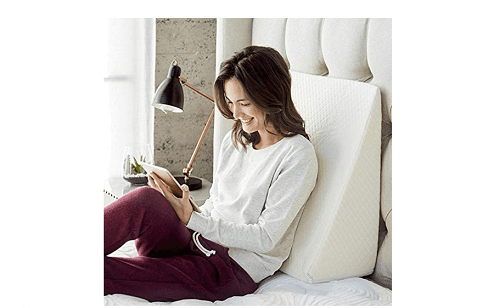 The top layer of this pillow is actually memory foam and will conform to the shape of your head and neck to provide you optimal comfort. 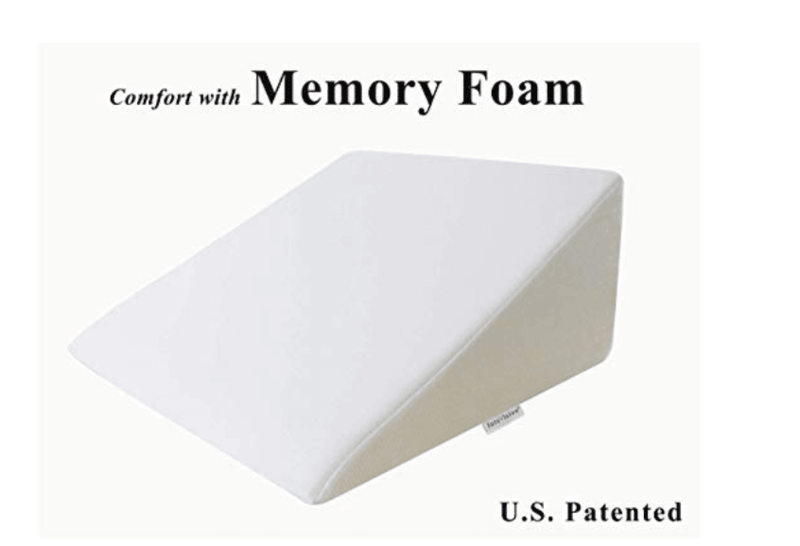 InteVision created a pillow that is made of two layers to give you not only a sturdy base but also has a top layer of memory foam to maximize your comfort. There will be better air circulation in this pillow because there are built-in channels to promote and push the air through the pillow keeping it cool throughout the evening. Like most wedge shaped pillows this one is specifically designed to help you with all of your sleep issues keeping you awake at night. You can order this pillow in one of three sizes depending on which better suits you, either in 25 x 24 x 12, 33 x 30.5 x 7.5 or 33 x 30.5 x 12. This pillow is encased with a machine-washable cover so no matter how often it gets used or how dirty it is, you can take the cover off and wash it clean. There is also a guarantee for a thirty day refund in the event that you do not find the pillow satisfactory to your liking and needs. Relax Home Life is a company that creates quality products and their Life wedge pillow is no exception to this rule. You can order this pillow in one of three different sizes depending on which best suits your needs. For those of you bamboo lovers out there you may find that this pillow will quickly become one of your favorites. It is made out of forty percent bamboo and sixty percent polyester, two different materials that you know and trust. This is a wedge pillow and is available made directly in America or you can choose to have an imported pillow. This company markets itself as listening carefully to its customers and responding and making changes to their product in order to give you the best pillow possible. There is a layer of memory foam on the top measuring one and a half inches in order to give you maximum comfort and for the pillow to learn the shape of your head. It is also covered with a case that is made from bamboo so it is breathable and allows for you to keep cool without sweating throughout the evening. If you are an allergy sufferer then you do not have to worry anymore because this is a hypoallergenic pillow preventing common allergies from agitating you as you are sleeping. Dust mites will also not be part of your problem anymore because it is dust mite resistant. This luxurious wedge pillow is available to you for purchase in one of three sizes, either in a seven, ten or twelve inch pillow. This is a therapeutic pillow which will help you sit up in bed while working with better posture than before. 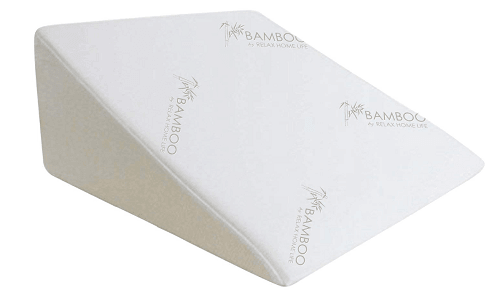 The cover of the pillow is made of bamboo which is a breathable material that allows for airflow and keeping the pillow cool throughout the night. For you allergy sufferers out there, you will love this pillow because it is hypoallergenic and dust mite free to keep your breathing calm and even throughout the evening. 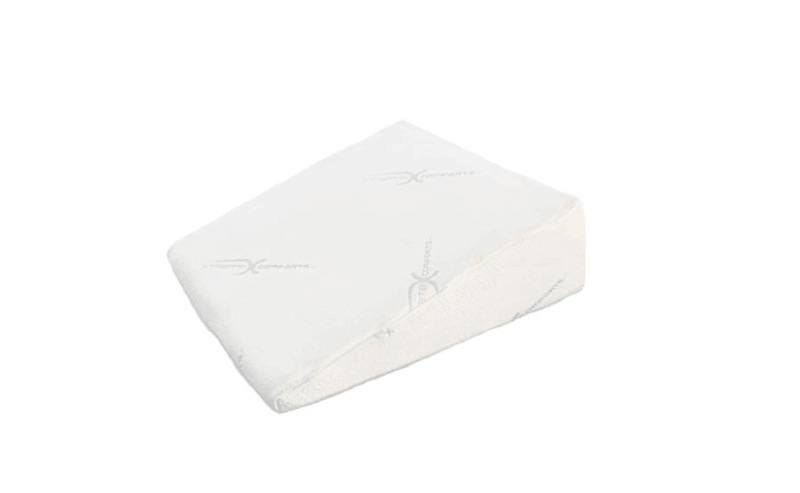 Xtreme Comfort creates many awesome pillow products that we know and love, and this wedge pillow is no different. Made at a thirty degree angle to give you the proper support and elevation that you need while sitting in bed or laying down to sleep. This pillow can be positioned anywhere under the body while you are relaxing or sleeping which means it will help more than your snoring issues. Whether you need to elevate your back, legs or neck you will find stress relief. This pillow comes with a lifetime warranty and is machine washable in case you find that it is dirty or overused over time. The pillow is designed to never go flat no matter how much you use it or how often it is sent through the washing machine. For those of you struggling with snoring or other sleep issues, it is very possible that making a simple change in your sleep equipment may change the way you sleep entirely. Not only does the type of pillow help but the shape and size of the pillow as well. 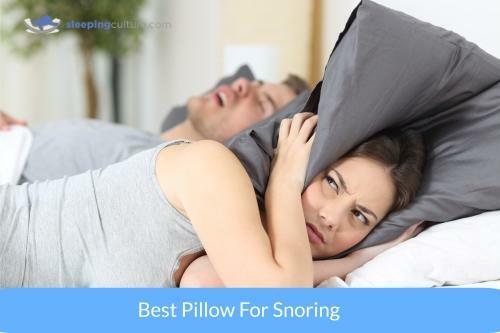 Most all pillows that are good for snoring or acid reflux are in the wedge shape and if you are not sure if a pillow is good for snoring, the shape itself can usually help you. These pillows are not only good for sleeping but good for you to do other activities as well. The pillows come with warranties or guarantees so you can try out your pillow for a period of time and if it does not meet your needs, you can send it back. Once you have gotten accustomed to the pillow and chosen which one is best for you, then you can purchase it and let your yourself slide into a deeper night’s sleep.